The tabulation of ethnobotany data used to produce these tables resulted in the statistics noted above. The tables developed consisted of 125 columns of ethnobotany terminology (with room for expansion); not all of these columns have received their complete sets of entries yet. 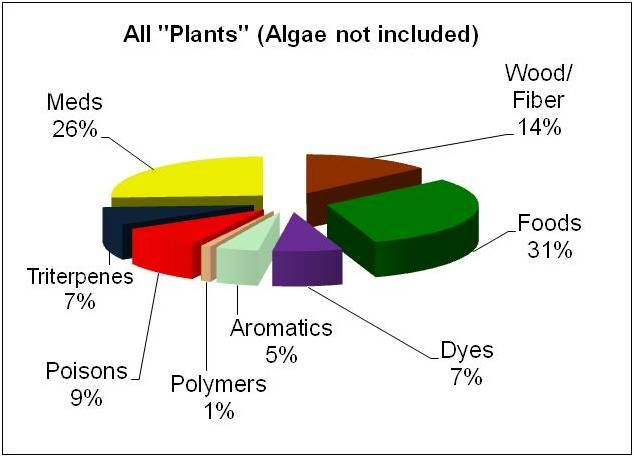 This is the distribution of all uses for all plants. Algae are typically included in my course on this subject, but have been excluded for this detail-oriented approach to reviewing my data. One of the first things to note is the largest number of genera utilized in some way, shape or form for a particular kind of use are food plants. These include everything related to food consumption, ranging from primary nutritional source, to spices and flavorants, to other types of unusual food additives, to beverages. (Food preparation items are classified along side wood and fiber products and other utilitarian methods of utilizing plants). Dyes, poisons and triterpene related uses are fairly common classes of ethnobotany plant use as well. The first two of these cross chemical groups in the plant kingdom. Dyes are perhaps the most widely dispersed. Their chemical classes can include carotenoids, chlorophylls, flavonoids, some iridoids, alkamines, benzylisoquinolines, etc. Poisons are almost equally dispersed, but the classification of “poison” is difficult to deal with as an American experience (less so for indigena). For a plant to be called a poison, some human toxicity relationships are included, like poison ivy. But for the most part, only selective toxins used for specific purposes, by different cultures, usually cultural settings in indigenous settings and developing countries, are covered in this section. These include plants known to be used for ethnic practices like poisoning the rhinoceros, attempting to kill a neighboring tribal leader for political reasons, using the plant as a piscicide (fish poison) or insecticide, etc. Other toxins that are poisonous, but not used as such, are not included here. Such as the vermicidal medicines used to treat intestinal worms. Other plant toxins that are usually included in this section are such classes as phenolic co-carcinogens (Euphorbs), cyanogenic glycosides, many hepatotoxins (Boraginaceae and Asteraceae), and specific highly selective alkaloidal neurotoxins. Now there are other fairly well dispersed chemical groups in plants absent from this review. The aromatics will be covered in more detail at some later point in time and subdivided more correctly into their various chemical groups. Alkaloids deserve some coverage of their own, as do the fixed seed oils. Like the triterpenoids, seed oils have multiple levels of ecological and environmental significance and so will have to be discussed in detail in the appropriate place and setting. The above charts and tables seem fairly simplistic. Their relevance will become clear in the next section when we see how these distributions of major chemical groups changes and evolves as the plant kingdom itself evolves and becomes more chemically complex.